Balloon walls make the perfect photo backdrop, or just provide a decor focal point. They can be done in a variety of colors and patterns. 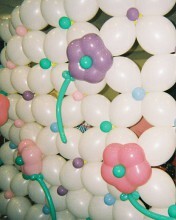 Click the button below to add the Balloon Walls to your wish list.